The Service Employees International Union announced Thursday that two more leaders have left the influential union over sexual harassment allegations. SEIU deputy organizing director Kendall Fells resigned and Detroit leader Mark Raleigh was fired, according to Bloomberg. 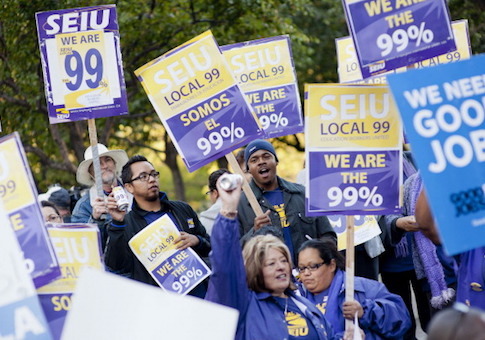 Both men were key leaders in the SEIU's "Fight for $15" campaign for a national minimum wage increase. "These personnel actions are the culmination of this stage of the investigation which brought to light the serious problems related to abusive behavior towards staff, predominantly female staff," an SEIU spokeswoman told Bloomberg. The departures come after the October departure of SEIU executive vice president Scott Courtney, who resigned after seven people told BuzzFeed News he had engaged in harassment. Courtney was also a leader in the "Fight for $15" campaign. An ex-SEIU employee also accused two of her former supervisors of sexual harassment last month, while declining to name who they were. The former organizer told the Washington Free Beacon that she reported the men to human resources, who initially seemed receptive to her complaint. But nothing came of the accusations and the men were later laid off for unrelated budgetary reasons. This entry was posted in Issues and tagged Big Labor, SEIU, Sexual Harassment. Bookmark the permalink.